In the spring of 2013, Derick was diagnosed with Medulloblastoma and through almost 2 years of treatments he fought courageously. No matter how hard the fight became, his happy spirit stayed positive and he wouldn’t complain. While undergoing treatments, he volunteered selflessly to serve as an advocate for other children in similar circumstances. He was always willing to speak to other kids and their parents about what it meant to be brave. Anyone who met Derick could tell immediately that he was a very special little boy. He was born in Sicily, Italy on October 9th, 2006. Being the youngest son born into a military family, Derick lived, as many military children do, traveling on many adventures and meeting friends from all over the world. It was in Sicily that he met his best friend Hunter. The two of them hit it off immediately and throughout their time hanging out in Italy and Spain they became thick as thieves. As a young and mischievous boy, Derick loved to play pranks on his friends and family. He would leave toy bugs and lizards to be found by his mom or older sisters in hopes of startling them, an activity that his best friend Hunter continues to this day in his honor. Derick always had a smile and charisma that would melt the hearts of everyone around him and he used his flirtatious charm every chance he got. He had a fond love for sports. He placed 2nd in a kids triathlon when he was five years old. Whether it was swimming, playing baseball, football, or basketball, his enthusiasm and competitiveness could easily be seen by the smile on his face when he was playing. Derick’s friends started a comic book called “Derick the Defeater”. The story of a super hero who fought evil villains in the form of cancer cells. By his bravery and his willingness to never give up, Derick became a hero both in the comic books, and to his family and friends. As incredibly painful Derick’s loss to all of us was, we are all so incredibly blessed to have had him in our lives. He touched so many with his beautiful soul, his bravery, and his love. We have started this fund in honor of his memory and to continue his legacy. It is our goal to bring hope to children and their families by raising awareness and through funding childhood cancer research. Through helping others, Derick The Defeater’s light will forever live on. These friends and family members helped us raise funds for childhood cancer research in honor of Derick! See the 2014-2018 list. In addition to raising funds for research, the Palmer family provides support to kids fighting cancer through their Wrapped in Strength Project. 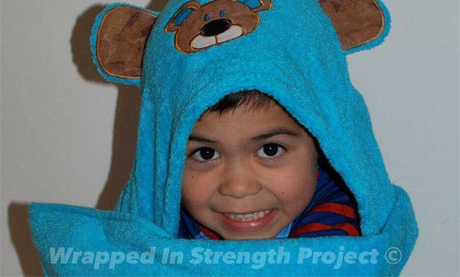 They make and distribute fun cozy hooded towels to bring smiling faces and warm hearts to children in the fight. Learn more here. 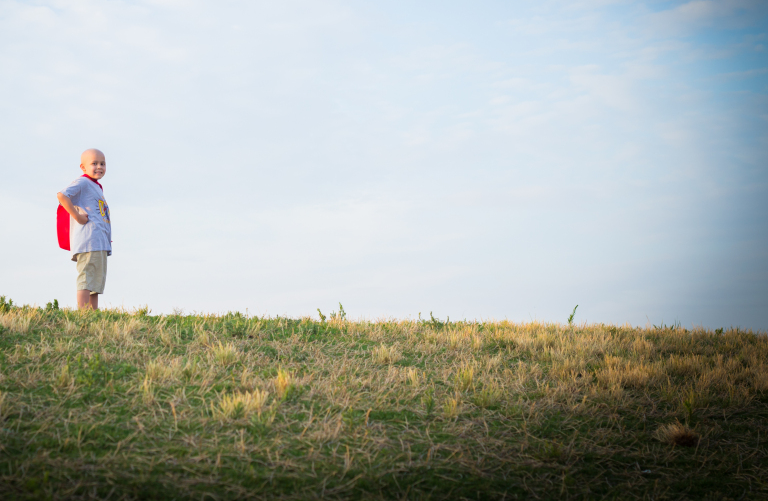 Childhood cancer affects thousands of kids and families around the world every year. This infographic shows a few realities you should know. 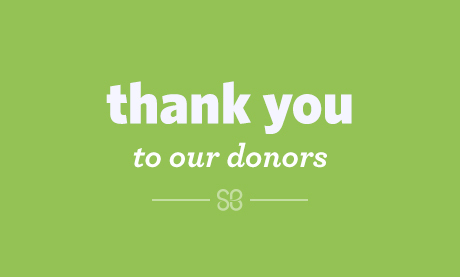 Donations given to the Derick the Defeater Fund go directly to the St. Baldrick’s Foundation to fund lifesaving childhood cancer research around the world. The Foundation is guided by a Scientific Advisory Committee, comprised of leading experts in the childhood cancer community, to ensure that every dollar makes the greatest impact for kids with cancer. These people make us smile - they’re the doers and money-raisers on behalf of the Derick the Defeater Fund. They’re shaving their heads, hosting events, starting fundraisers and more to make childhood cancer research possible.